Mine discharge mixed with stagnant water to southeast of Bird Dog chat pile, just above 20 Road. Image by author, December, 2010. The Idrisi Taiga modules used in this project offered satisfactory results in identifying variabilities and changes in land cover through processing of Landsat satellite imagery. The program's classifiers are a useful tool for pinpointing variabilities and changes with greater confidence than simple study with the human eye alone. 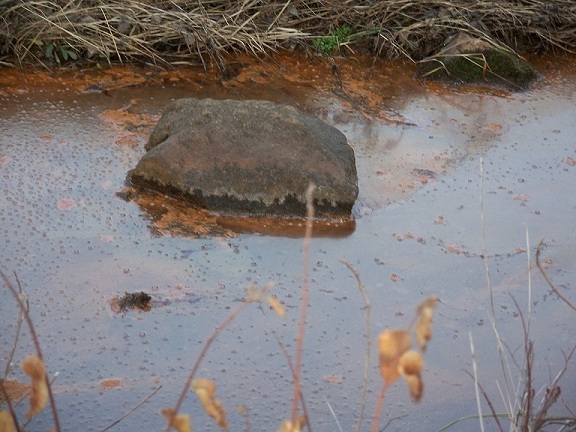 In "seeing" the spectral evidence of ongoing change in the Tar Creek Superfund Site, the magnitude of this environmental tragedy is emphasized. With additional information and input from area environmental agencies, for instance, from the Quapaw Tribe's Environmental Office staff, the Land Change Modeler module could be utilized in the future for long-term planning purposes.